You can import your investment data directly from supported brokerages. Brokerages provide both your current holdings as well as historical transaction data from your account. You may also be interested in reading the section on Brokerage Import - Best Practices. Select your brokerage from the supported “Brokerages”. Our Brokerage List section details which brokerages are currently supported by StockMarketEye. If your brokerage is not listed, contact us to see if we will be able to support it in a future version. Next, enter the “Username” and “Password” you use to access your brokerage’s website. When you have entered your access information, click on the “Next” button to download the list of your accounts at this brokerage. 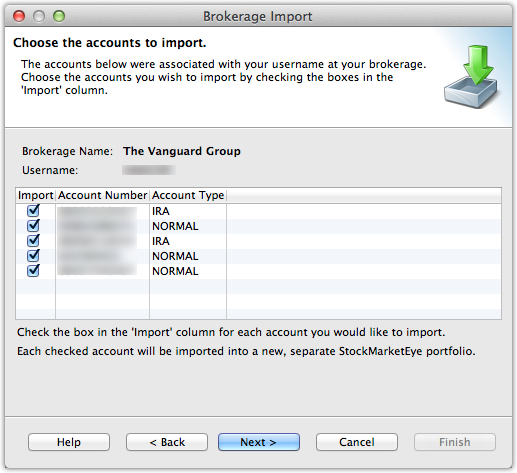 You can also fill in the “Account Number” field, if you would like to import just a single account from your brokerage. See the section, Importing A Single Account, below. If you leave the “Account Number” field blank, StockMarketEye will present a list of all your accounts at the brokerage. You can then choose the ones you wish to import into StockMarketEye. Depending on the brokerage, StockMarketEye may not be able to retrieve the list of your accounts from your brokerage. If this is the case, you will need to fill in the “Account Number” field with the number of the specific account that you want to import. See Importing A Single Account below. Your brokerage access information is only used to download your account list, current holdings and transactions. StockMarketEye does not store your brokerage password. However, your account number and username are saved to facilitate future interaction with the brokerage. 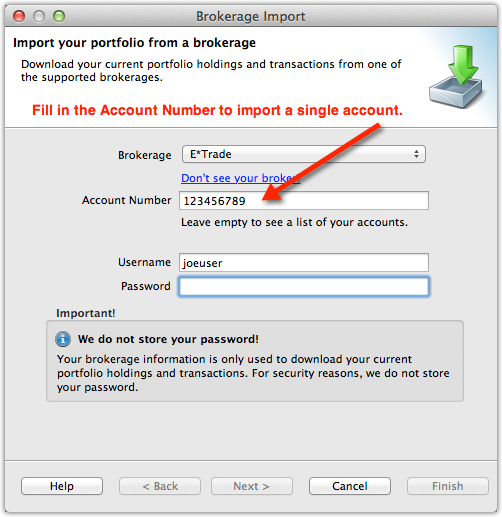 After downloading the list of your accounts from the brokerage, you can choose which accounts to import. Check the box next to the accounts you wish to import. 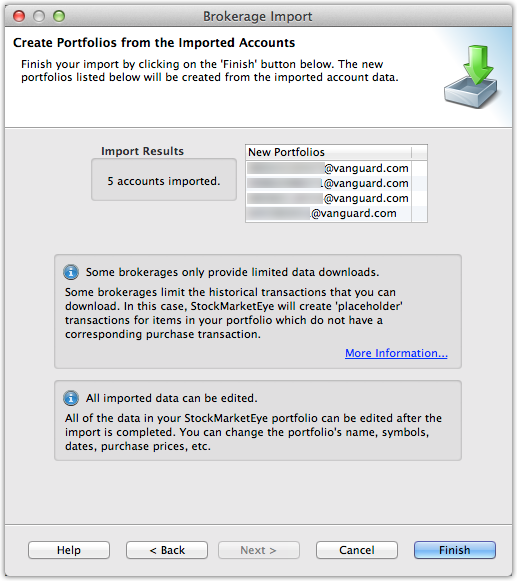 Each account you select will be imported into a new StockMarketEye portfolio. The name of the new portfolio will be account-number @ brokerage. For example, if your account number at Vanguard is 1234567890, the new portfolio will be called “1234567890@vanguard.com”. You can change this name after the import. Click on the “Next” button to start the import. When the import has completed, you will be shown a list of the new accounts created by the import. Brokerages often limit the historical transactions that can be retrieved. For example, a brokerage may limit the transactions to only those that have occurred in the past 90 days. Some limit transactions to those from the past 1 or 2 years, while others provide data since you opened the account. Our Brokerage List section explains the specific limitations of each brokerage supported by StockMarketEye. 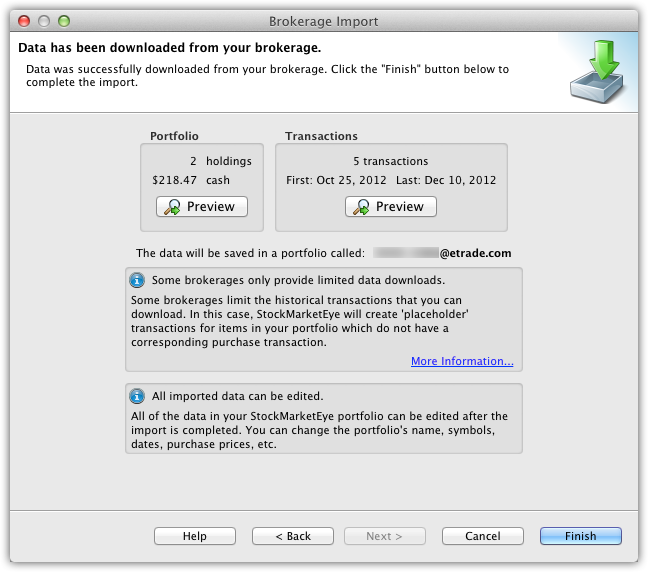 After the import is finished, you can edit any of the data downloaded from the brokerage. In addition to being able to change the portfolio’s name, you can change transaction dates, symbols, purchase prices, transaction costs, etc. You should also be aware of the placeholder transactions that StockMarketEye may have created. You can read more about placeholder transactions in the section, Brokerage Import - Placeholder Transactions. If your brokerage does not allow the retrieval of the list of your accounts, or you know the account number of a specific account you would like to import, you can import an individual account if you know the account number. To import a single account, follow step #1 above. In step #2 above, enter your brokerage “Username” and “Password” as well as the “Account Number” you would like to import. Click “Next” to download the data for this account. When StockMarketEye has finished processing the data downloaded from the brokerage, you have the opportunity to preview that data before it is imported into a StockMarketEye portfolio. Click on either of the “Preview” buttons to view your current holdings and the historical transactions that the brokerage has made available. When you click “Finish”, the downloaded data will be saved in a new StockMarketEye portfolio. 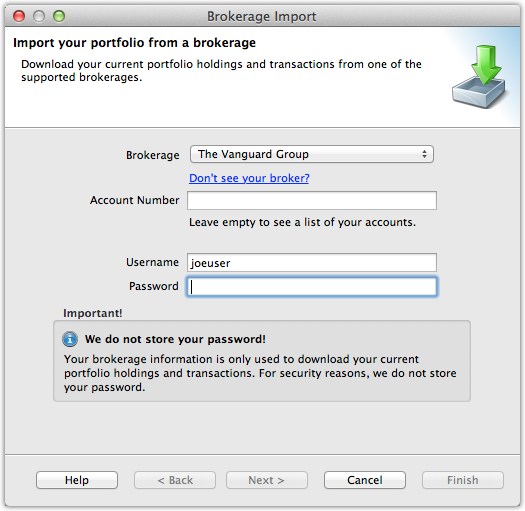 This portfolio is, by default, given the name of your account number ‘@’ your brokerage name. For example, if your account number at E*Trade is 123456789, the new portfolio will be called “123456789@etrade.com”. You can modify this once the import is finished.